And they come with an anti-thigh gap message. A group of very fit and very ripped athletes are sick and tired of not being able to find jeans that will comfortably cover their fine muscular bodies. So they’ve created Barbell Apparel jeans that are designed with small waists and “meaty” thighs in mind. 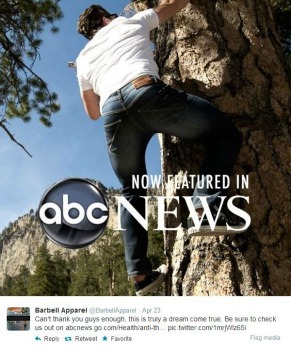 According to the brand’s Kickstarter page, the makers of Barbell jeans spend a minimum of 20 hours per week in the gym and do things like mountain biking and snowboarding in their downtime. So they know the problem first-hand. We do not, but all of that sounds pretty bad. The brand’s crowdfunding efforts have certainly benefited from the media attention they’ve been getting from Fast Company, The Huffington Post, Business Insider and other outlets. The jeans promise more flexibility, “custom stamped rivets,” “hand finished brass buttons,” and many more features. And they’ve had the platform to talk that up. But more than that, the co-owner of Barbell is using some very trendy language to generate interest in their special jeans for juicy thighs. According to Hunter Mozlen, these are “anti-thigh gap jeans.” In case you haven’t heard, the thigh gap is the latest body issue obsession, directed of course at women. Beyonce has been accused of Photoshopping one into an Instagram photo she posted. And Land’s End has been charged with adding one shaped like a Dorito into its catalogue. Dr. Oz has even dedicated an episode of his show to addressing the topic, highlighting the unhealthy lengths women will go to to achieve a thigh gap. “Athletes work hard for their strong, meaty thighs and they should be proud of them. It’s how human beings were built to function,” said Mozelen in an interview. In itself, it’s a great message. These are clearly some very toned people and if they don’t care about a thigh gap, you shouldn’t either. But speaking out on the thigh gap issue will also make Barbell a go-to resource for stories when the novelty of the launch of “jeans for fit people” wears off. It’s a message that’s in line with what the brand already is, providing ready-made PR opportunities for the future.